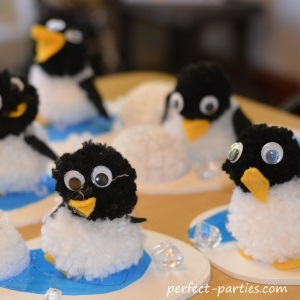 Penguins are a favorite of my twins and they came up with the theme and party ideas! 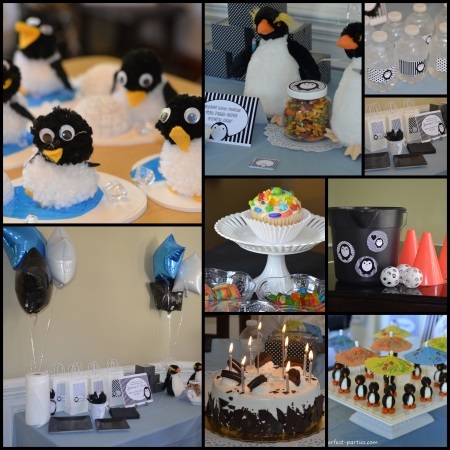 We found games, crafts and favors to go with the this theme and kids had a great time and a lot of compliments from adults. One of your easiest places to find solid color paper products is Amazon, Dollar Tree or Walmart. 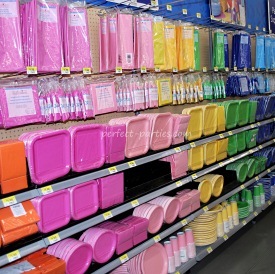 Party City is also has many colors that are hard to find at other stores. 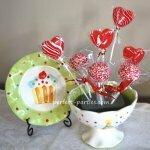 For invitations and candy wrappers you can find them on eBay or on Etsy where you can have a template sent via email and you print labels and invitations on your own printer. Color scheme light blue, black and white. We chose light blue table cloth, black plates and napkins, light blue forks and spoons. We found this all at the Dollar Tree. 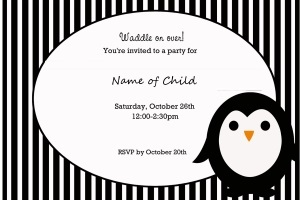 On Etsy we found a set to print out invitations, signs, water bottle labels. 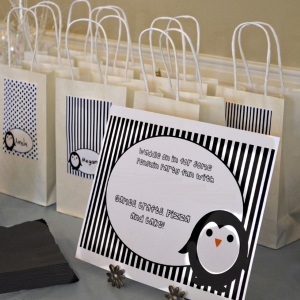 You can find personalized options for invitations on Etsy or eBay. 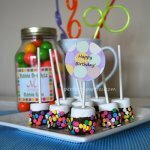 Sellers on Etsy often will customize a party pack template which includes a selection of items including invitations, cupcake toppers, water bottle labels, banners, and snack labels. If you email them, most will allow you to pick out the items you want. Printing on photo paper from Costco make beautiful glossy invitations and signs. 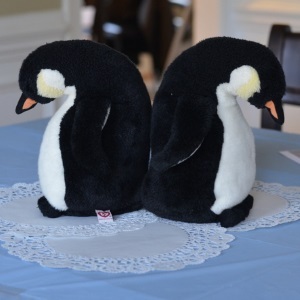 We found plush animals to decorate the party tables. We also found Ty Baby Beanies on eBay as part of their goodie bag treat along with penguin pencils. 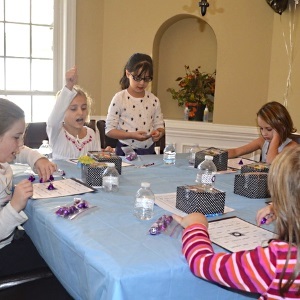 Party balloons in the theme colors blue, black and white add a lot to the party atmosphere. If you get the mylar type they will last a few days. 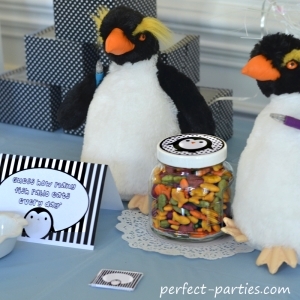 While guests were arriving, e had a table set up to "Guess How Many Goldfish in the Jar". We play all games for fun and send home goodie bags and make and take projects home with each child. If you wanted you could send the jar home but I'd find a plastic one or a bag of Goldfish. We had materials set up for each child to make a pom pom penguin. Since they were a little older, we also had them make a scene with an igloo and pond. Great make and take craft. We will post a how to page shortly. 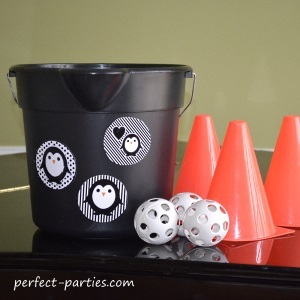 Simple game to keep kids busy while I set up the next activity or for those who finished the Penguin Pom Pom project quickly. Great for all ages. I had the girls research Penguins and we made our own Penguin Bingo Game. 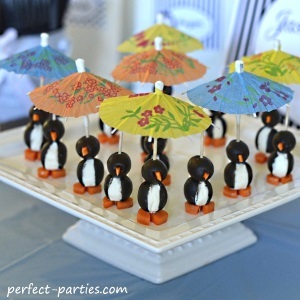 The game pieces were purple kisses with a penguin picture taped to the bottom to add to the theme. 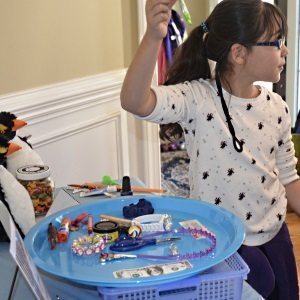 Gather items like scissors, hair clips, rubber bands, erasers, pencil and place on a tray. More items for older children, less for younger. Give children all a view of the items for 1 minute (more for younger kids) and then have each child list as many as they can remember. Go over the items after and see who could remember the most. 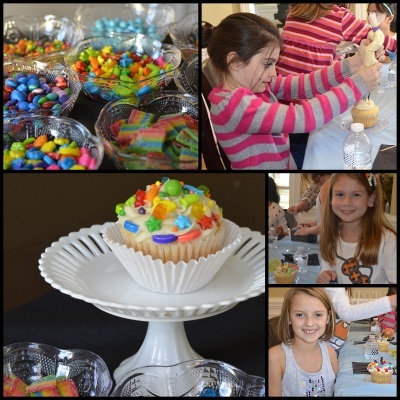 We had each child decorate a jumbo home made cupcake with frosting and fun candies. We found cute cupcake boxes for them to take it home. We found mini TY Beanie Penguin, penguin pencil, penguin eraser, bubbles, and a package of goldfish crackers. 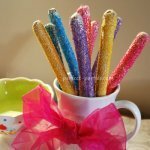 I posted items similar to what we found below on Amazon and they had their Candied Cupcake and Penguin Project to take home as well.